Registered Teams: Branson, Camdenton, Carl Junction, Glendale, Joplin, Kickappo, Lebanon, Nixa, Ozark, Parkview, Republic, Rolla, Smith-Cotton, Webb City, Willard, Bolivar, Buffalo, Marshfield, Monett, Nevada, East Newton, Reeds Spring, Willow Springs, Butler, College Heights, El Dorado Springs, Plato, Pleasant Hope, Sherwood, Stockton, Marionville, Crane, Green Ridge, Humansville, Weaubleau, Chadwick. This meet is HUUUUUGE and FAST. Look for several of the top times in the State to come from either here or the Tim Nixon Invitational this weekend. There are four State Ranked teams running her on the Girls side including Class 3 #1 Bolivar, Class 2 #5 College Heights, Class 1 #7 Crane, and Class 4 #15 Carl Junction. Class 3 #6 Anna Bandy of Bolivar leads the way individually and several of her teammates will also be running up front. The Boys race will feature several ranked teams with Class 3 #2 Bolivar, Class 1 #4 Weaubleau, Class 3 #5 East Newton, Class 2 #5 College Heights, Class 3 #6 Stockton, Class 1 #6 Humansville, and Class 4 #8 Webb City all attending. As far as individuals go, Class 1 #2 Chase Ratliff, Class 1 #4 Evan Smith, Class 3 #6 Caleb Pyle, Class 2 #5 Bryson Coulter, Class 4 #9 Keifer Dooley, and Class 1 #10 Braeden Decker all should be racing Saturday. This meet has the potential for fast times as the course at McNair Park is fairly quick. The girls side will feature a young but still State Ranked Francis Howell (#10), and will have a number of strong individuals including Claire Ayers and Mia Reed from Washington's new look squad. The boys race will have Class 3 #10 Clayton, and will be lead by Washinton's Noah Little for the individual title. There are several State Ranked teams on the Girl's side with Class 2 #1 Fatima, Class 1 #3 Hermitage, Class 3 #5 Helias, Class 1 #9 Russellville, and Class 4 #16 Liberty (Wentzville). Fatima brings trio of State Ranked individuals as well with Kendall Haller, Alyssa Struemph, and Alexis Fischer. Another interesting watch will be the debut of former junior high phenom Ally Kruger from Liberty. The boys race will feature several State Ranked Teams as well with Class 2 #1 Fatima, Class 1 #5 Hermitage, Class 4 #7 Jefferson City, and Class 3 #7 Helias. 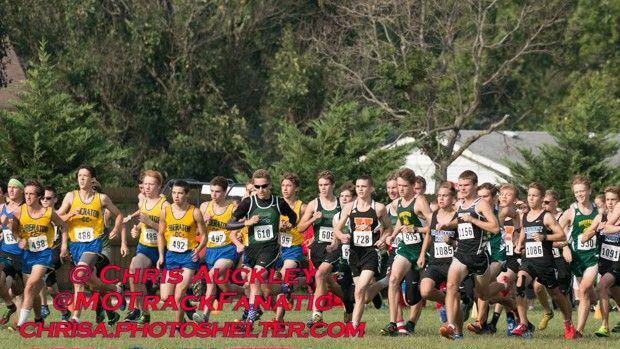 Class 3 #2 Jack Crull, Class 2 #3 Isaac Ashton, and Class 2 #9 Lucas Laux are the top ranked individuals in the race.